Hey kiddies! Are you enjoying your summertime? The sun, the games, the school break, the pool... Ah, it's a good time to be a kid! So how about a new toy? Everyone loves toys! 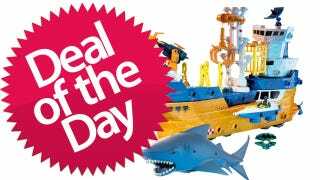 And this $27 Mega Rig Shark Ship Set (regularly $60) comes with an evil-looking shark with glowing red eyes and jaws ready to clamp down on your leg! There's also a ship—an oddly modern ship with harpoons, cranes and apparently an air control tower. For the non-existent flight deck. In case you want to call in an air strike on the shark. It does float, though. So that's pretty cool. And the ship can apparently be made into other vehicles if you want. But the shark, the shark stays the same—terrifying and perfect.